Rome is the last city on our European travel ticket. We have saved the best for the last, the grandest of all the sights and the most ancient of all the historical places we’ve visited so far. We alight from the notorious Bus no 64 with our pockets intact and start walking. Our trolley bags make quite the racket as we drag them towards our hotel on Via Giulia, the cobbled roads proving to be the most difficult surfaces that we’ve faced till now. These square stones are quarried from volcanic mountains and our luggage wheels going down and up the gaps between adjacent stones, emanate sounds that remind me of the clatter of horse-drawn carriages. Looking around, the streets seem empty at noon and the sunlight reflecting off the pastel colored buildings seems to add a tinge of sepia. Every other lane seems to contain a structure that looks like it has seen history, if not been a part of it. Our walk to our hotel is almost like taking a walk back in time. We realize that day, why Rome is called the Eternal City. She had always been fond of history, and here [in Rome] was history in the stones of the street and the atoms of the sunshine. Check-in is a breeze at our hotel at Maison Giulia, located just a Roman stone’s throw away from the campy neighborhood of Trastavere. Our receptionist pulls out a huge map of Rome and starts marking attractions when my eyes roll over. There are hundreds of sights to see, how are we to see everything within 3 days ? In the end, we decide to entrust things to our trusty Rick Steve’s audio guides. 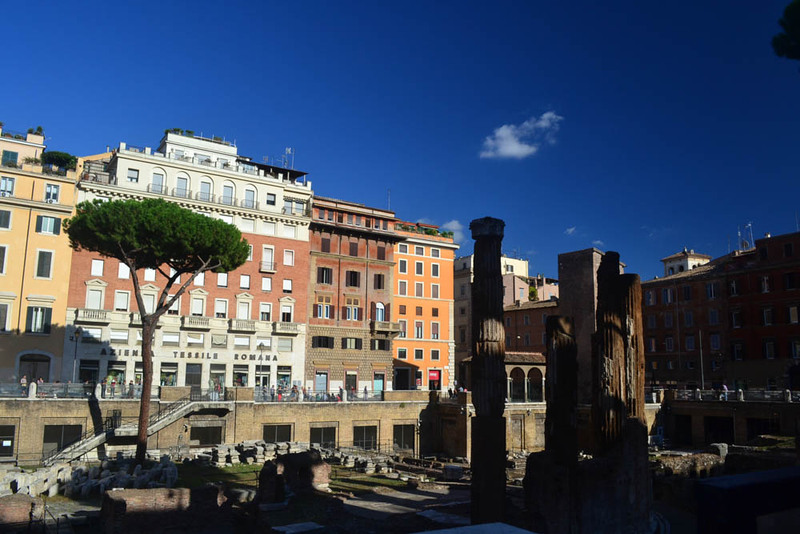 As evening sets in on this piazza, we side-step buses and trams to stumble on to our first view of ancient Rome – the Largo di Torre Argentina. Discovered during an excavation in 1929, this site sits below street level and contains Roman temples. Stirring with cats everywhere (once we spotted the first one, we couldn’t stop spotting countless others), this is *actually* the spot where Julius Caesar was assassinated. We walk past bustling tramways, huge piazzas and lots of traffic. Soon, we see a cylindrical bricked structure in front of us. To me, it resembles a gigantic cookie jar. There is a roar coming from beyond, almost like a huge gathering of people. The moment we cross the corridor, we realize that we were looking at the posterior of the Pantheon all along. What a magnificent sight it makes from the Piazza ! What a gathering of crowds it has pulled in ! The Pantheon in Rome. Symbolic. On a Sunday, the line stretching in front of the Pantheon is long, but moves quickly and within 15 minutes, we are inside. Outside the crowds are having a gala time. They’re cheering on musicians, daredevil stunt-men playing with fire, pantomime artistes, haggling with souvenir sellers or indulging themselves in a gelato on a hot day. The sheer scale and size of the Pantheon is astounding. Stepping into it’s portico, we are surrounded by gigantic granite pillars that were brought in all the way from Misr, modern day Egypt. 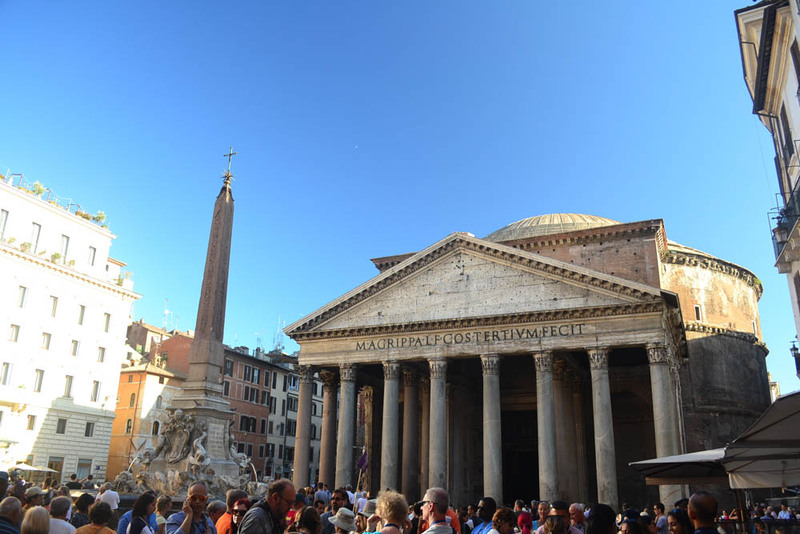 This piazza in front of the Pantheon is the Piazza Rotunda, from the Latin Rotundus – meaning any building with a circular ground plan. This fountain is fairly modern compared to it’s surroundings, but the obelisk in it is anything but. 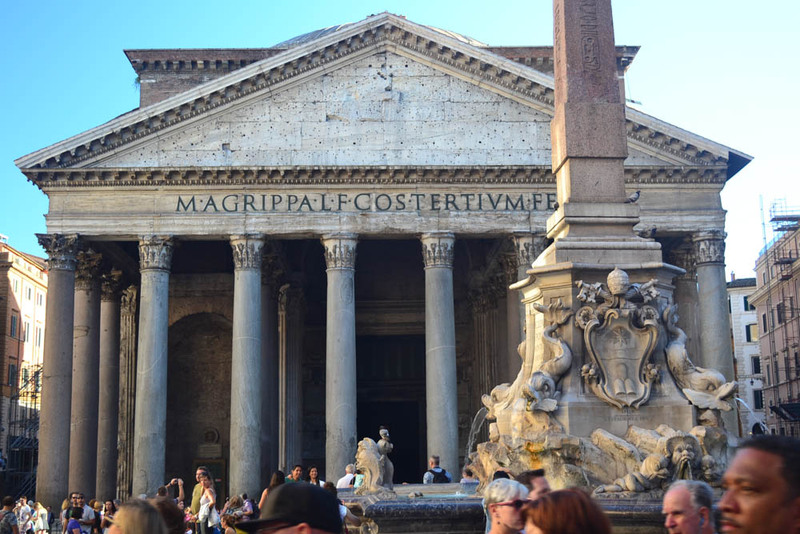 Farther in the distance, the lettering on the Pantheon translates from Latin into “Marcus Agrippa, son of Lucius, made [this building] when consul for the third time.” (Courtesy Wikipedia) – Imagine your name in a lettering that stands for close to 2000 years ! That, is literally writing your name in the history books for posterity ! How many inspirations did the Pantheon spawn ? It’s dome inspired Michelangelo’s design of the dome of St Peter’s Basilica, Brunelleschi’s design of the Duomo’s cupola in Florence and countless others, most notably in the modern day, the white house dome in Washington DC. 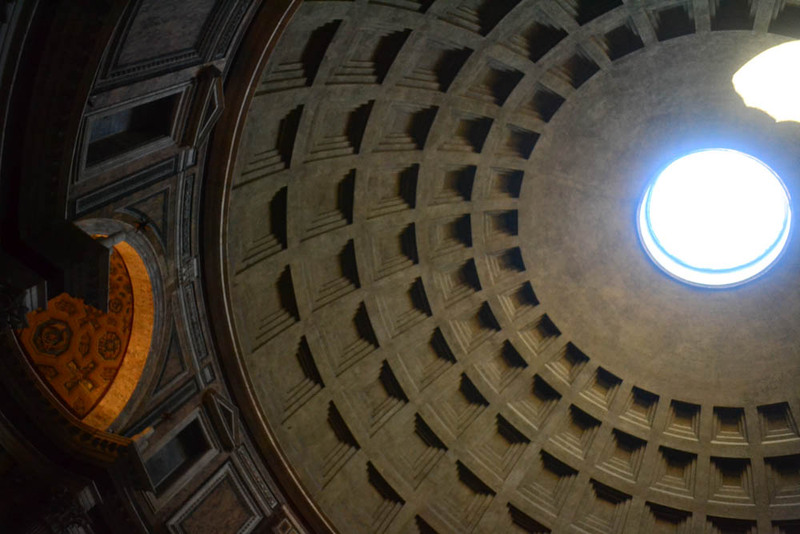 It is difficult to suppress your excitement beneath the cavernous dome of the Pantheon. Entombed in this ancient Roman temple turned church, are Raphael whose work we witnessed at the Uffizzi in Florence and Victor Emmanuel II who created and ruled over a united Italy. The woman his son married, was the Margherita of Savoy, whose favorite colors of green, white and red adorned the medieval and present day modern flag of Italy. Along with their son, she also gave birth to a legend. Apparently, from a variety of pizzas created to commemorate her visit, she chose the ones with her favorite colors – those of basil, mozzarella and tomato. This is the eponymous Margherita pizza. Famous for it’s Fountain of Four Rivers, the Piazza Navona in the evening is occupied by tourists, painters and faux painters selling Chinese artwork disguised as Italian, jugglers, musicians and people-watchers. It’s numerous cafes look a tad expensive though. In one of the shops enroute to Piazza Navone, we find folders filled with lithographs of every size. The kind old gentleman at the shop indulges us, pointing out the difference in the original water color paintings that cost a little over 100 euros, to copies that look the same but are way cheaper. Famous for it's Fountain of Four Rivers, the Piazza Navona in the evening is occupied by tourists, painters and faux painters selling Chinese artwork disguised as Italian, jugglers and people-watchers. It's numerous cafes may be a tad expensive, but sitting down is an experience that is not to be missed. 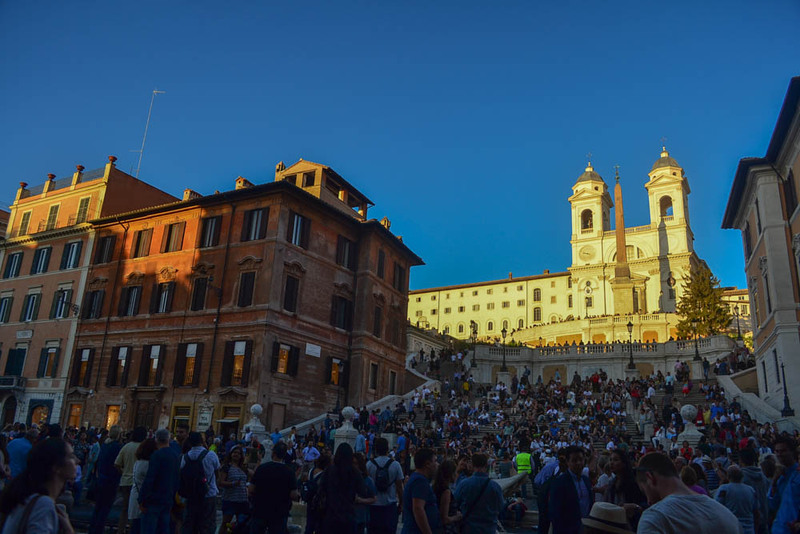 From Piazza Navona, we walk towards the iconic Spanish steps, so named due to the presence of the Spanish embassy nearby. We take a different route, walking through the shopping street that our receptionist has told us, we’ll love, Via Condotti. This street is lined with the whos-who of Italian and foreign luxury retail outlets, so we indulge in the the only thing we can afford to – window shopping. The street is also choc-a-bloc with human traffic and from afar, we can already spot the Spanish steps. The setting sun has painted the steps a shade of golden. First made famous in A Roman Holiday, the steps have also served as a backdrop in The Talented Mr Ripley, To Rome with Love; Eat, Pray and many more. We can hardly find a spare step on the lower tier on a Sunday and thus, we miss out on the pale Orange building, where the poet John Keats looked out on to the steps every day before succumbing to tuberculosis. The top of the Spanish steps houses a lot of souvenir shops and painters and caricature artists parading their wares. 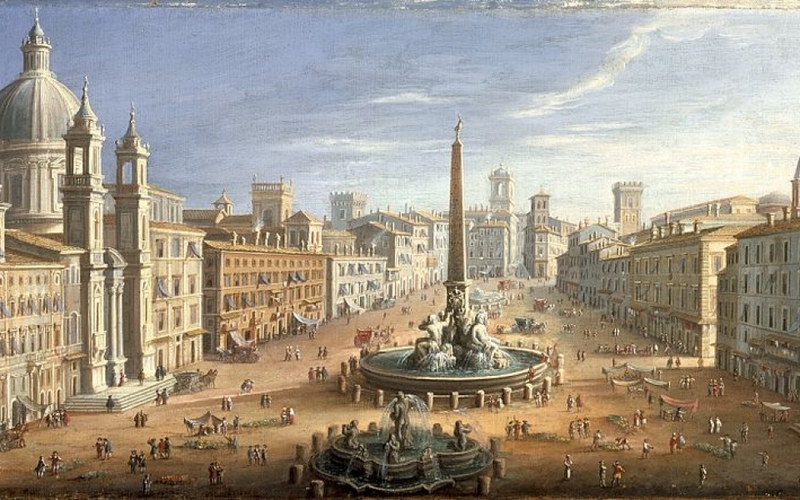 Folks hunting for good paintings can try their luck here or at the Piazza Navona. Rome is also considerably warmer and all the walking around has meant a craving for something cold. This, we are quick to indulge in, as we walk away from the Spanish steps. Containing lesser air as compared to ice-cream, we find Gelatos decidedly smoother in texture and denser in the flavors it packs, the bigger ones quite filling indeed. With Gelato in hand, onward we move, to the next popular attraction, the Trevi fountain. Built as an ode to the water gods, this place has seen fountains since ancient times. Every moment, there is a coin tossing mania going around here, which also serves as a secondary source of income for the city. 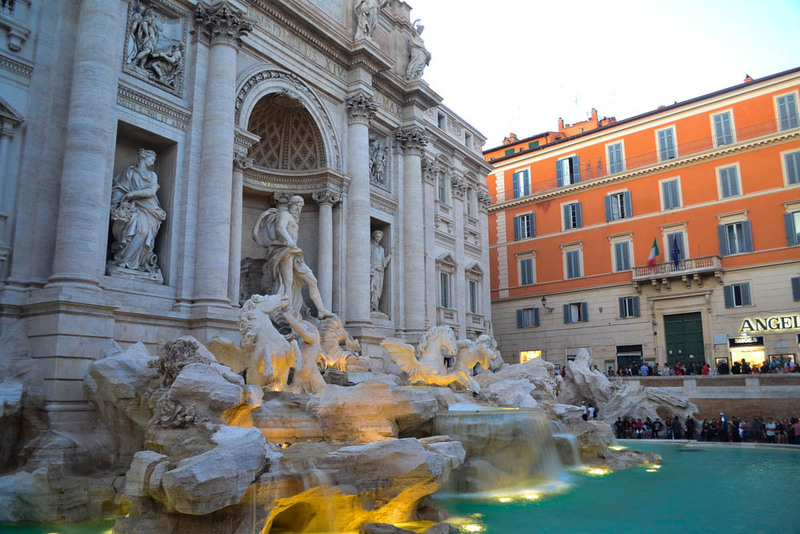 It is maniacal around the Trevi fountain where tourists want to ensure that the opportunity of coin tossing and ensuring a return to Rome doesn’t go abegging. So amidst much crowds and with barely any elbow room, we toss a miserly few cents into the fountain. There are ample opportunities of getting pickpocketed here, so we move on and call it a day. But not before we tuck into an Italian pizza. The next day dawns bright and sunny again and we take a leisurely stroll to that icon of Roman architecture, the Colosseum. Our tickets have already been booked, but we are nevertheless accosted by guides who greet us with a ‘Namaste‘. Undeterred by our refusal, they still wave us on to the correct skip the line queue, which is admittedly long at 10 in the morning. 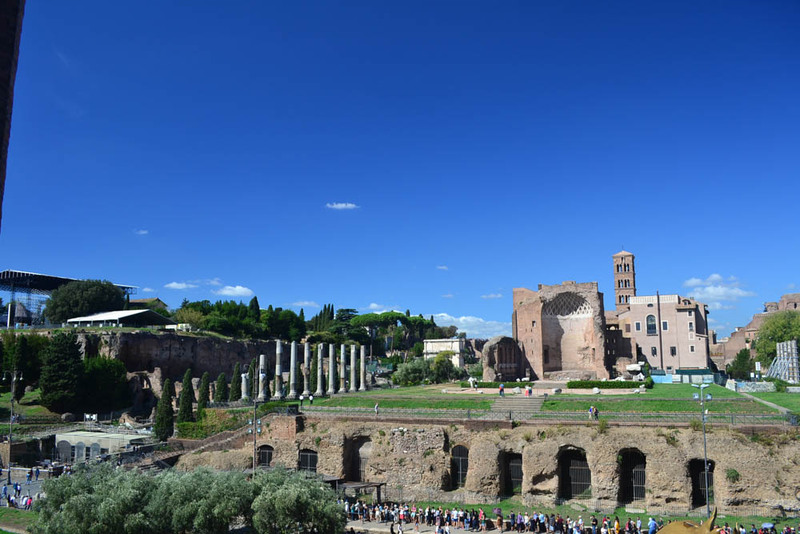 You see, there are 3 entrances if you’ve booked tickets for the Colosseum, the Roman Forum and the Palatine hill, with the last one being the shortest. 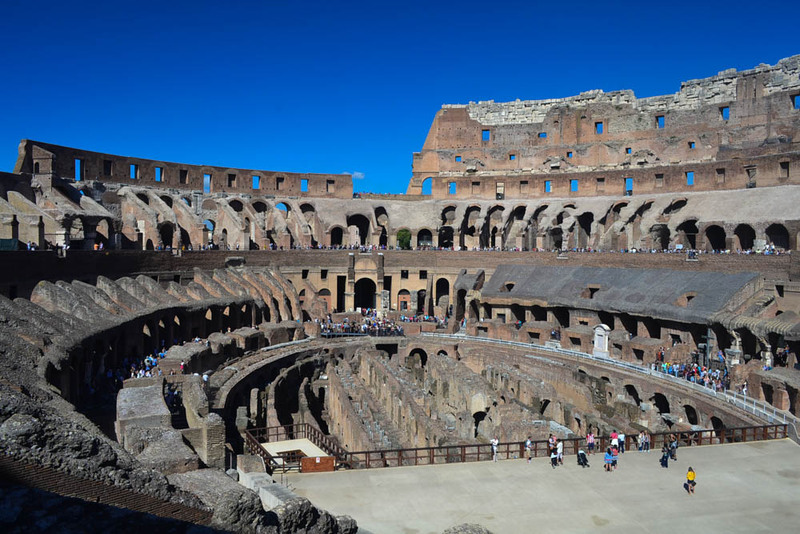 But we want to spend the most time at the Colosseum, since the light and the sun will be gentle this time in the morning, as compared to later in the afternoon. Our queue moves quickly and we climb up the stairs to the first level of the Colosseum. Grand as they come. Our tickets provide entrance to a few restricted areas only and you need to book separate tickets or guides for the other areas. But even from here, the grandstands of the arena make for a breathtaking sight. 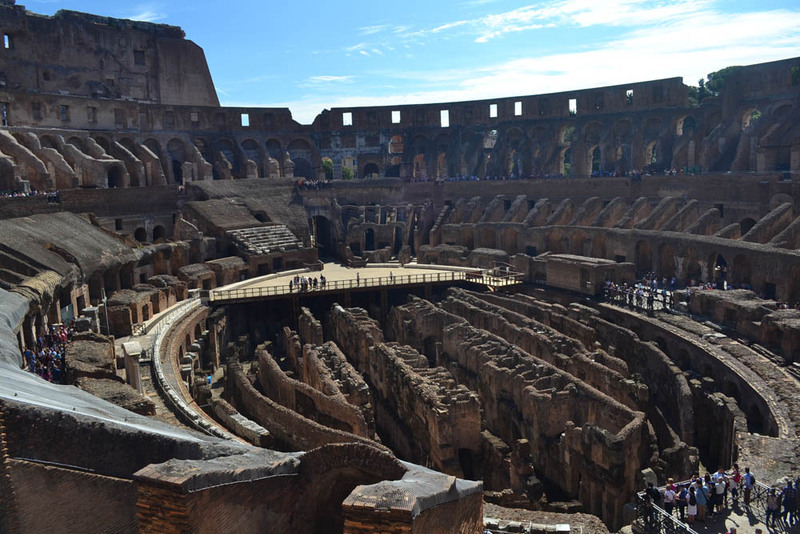 We imagine the horns, the cheers and boos of a bygone civilization as they watch from the stands, the roars of animals and the war cries of gladiators as we circumnavigate the Colosseum. 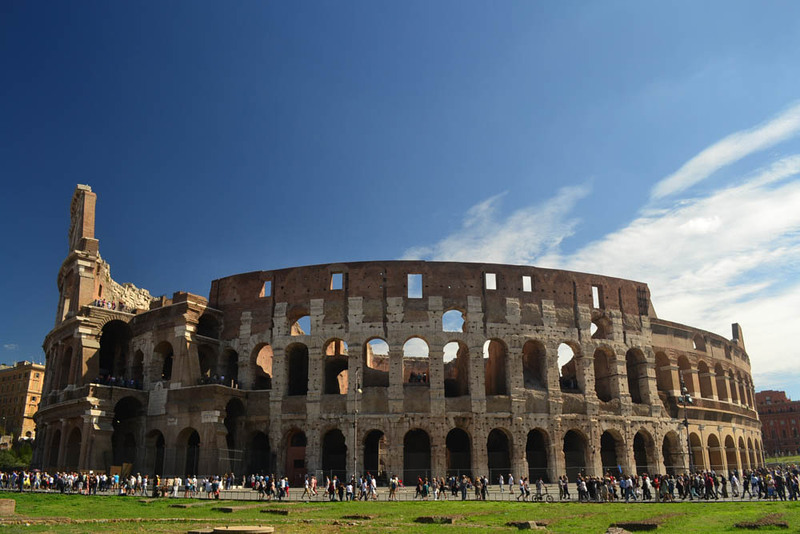 Rick Steves, our personal guide, paints an evocative scene with his voice in our ears, as he drills into the circumspect ability of the Colosseum to be flooded and drained, to enable a grand spectacle of naval victories and losses. The roars of wild animals as their leashes barely restrain them. The popular thumbs down that marked the end of a gladiator’s life. Built around 80 AD, not much of the Colosseum still remains, but even of them, the views are staggering. It is clear that this amphitheater-like setting, was one of the earliest stadiums that mankind built, just that the sport was of a violent kind. Time has eaten away the arena itself, but you can make out the basement hiding pathways that could have served various mechanisms to introduce gladiators, animals and other props that were an intrinsic part of the spectacle inside the Colosseum. The floor was covered with sand, and in fact the Latin for sand is, guess what, ‘arena’. 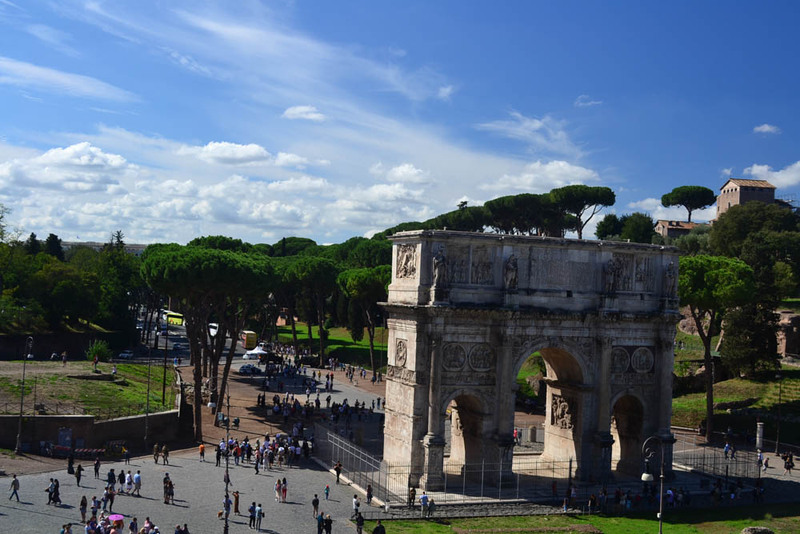 From a viewpoint inside the Colosseum, is visible the beautiful Arch of Constantine. 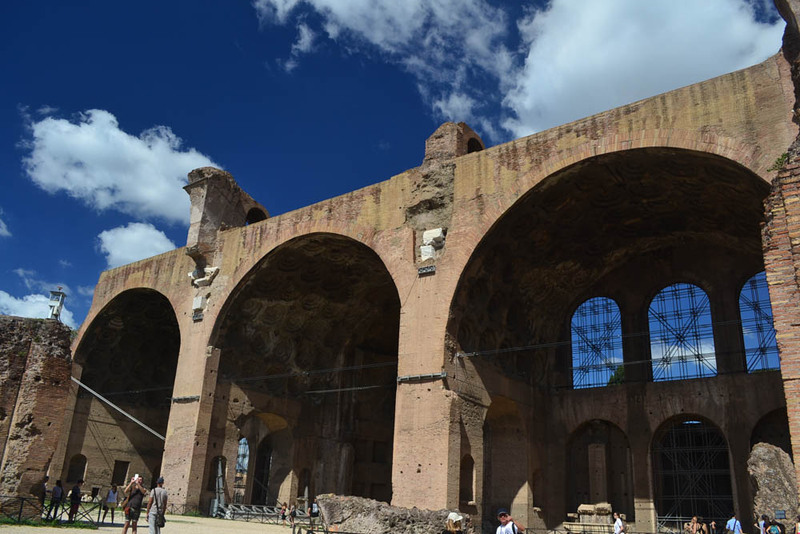 Built by the emperor Constantine in the 4th century, this arch also coincided with the rise and unchecked spread of Christianity, deviating from the pagan origins of Rome. And turning right, from the same viewpoint also has this view of the Roman Forum, our next destination for the day. A quick check-in against the turnstiles of the Roman Forum’s entrance, we are staring at the Arch of Titus. From here, as in the last picture, we can glimpse the Palatine hill on our left. Shaded by numerous trees and peaceful, with a musician playing a strange drum that seems to induce sopor. On the right, we can see numerous arches, a bell tower, huge white pillars and various ruins. 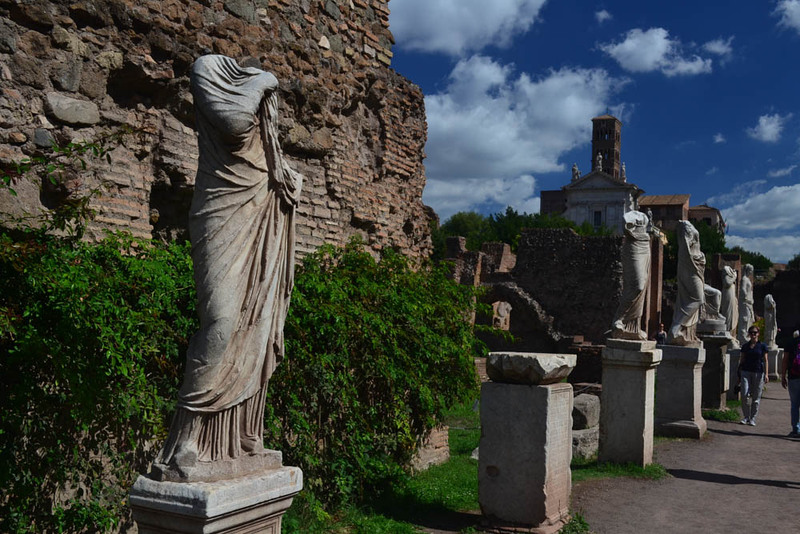 This is ancient Rome, the Roman Forum. We begin our walk on the ‘Via Sacra’, the Sacred Road which is barely wide enough for 4 or 5 people. As we walk along the cobbled path, our audio guides paint a picture of a triumphant emperor returning from a successful campaign, with crowds thronging the Via Sacra and cheering the army on. To think that one would have been looking at a colossal (yes, that’s the word) basilica here, were it to be still standing, takes my breath away. We walk back on the Via Sacra again. The same stones on which Caesar, Marc Antony, Titus, Constantine and other famous Romans once walked. Romans had thousands of gods. So much so that, people had their beloved, deceased ones also declared as a god or goddess, before dedicating a temple like this one, to them. 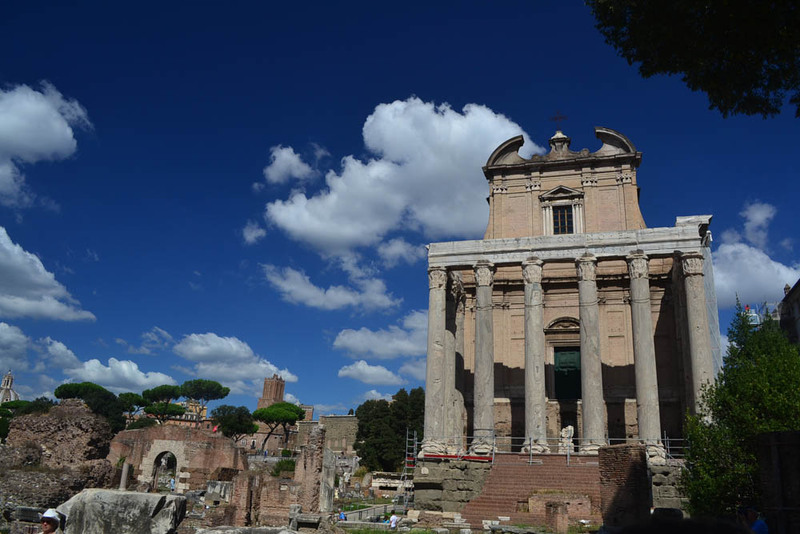 The temple of Antoninus and Faustina. The Vestal Virgins, whose duty it was to tend to the sacred flame in a temple dedicated to Vesta, the goddess of home and hearth. All of this history and walking around in the hot afternoon sun has taken it’s toll on us, and we move on from the Forum, looking for lunch. 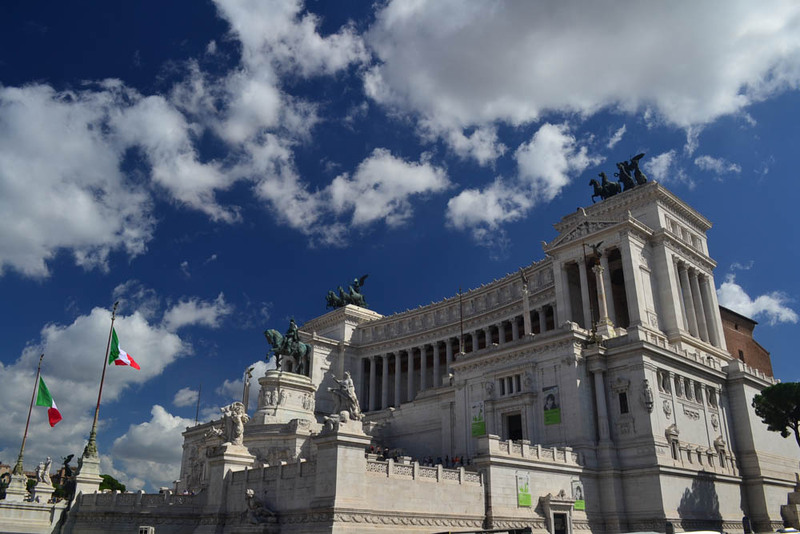 But not before sighting the famous Piazza Venezia and it’s famous palace, the Palazzo Venezia, the embassy of the Republic of Venice in Rome. A grand piece of architecture is this palace, from where the famous dictator Mussolini gave public speeches to his supporters. 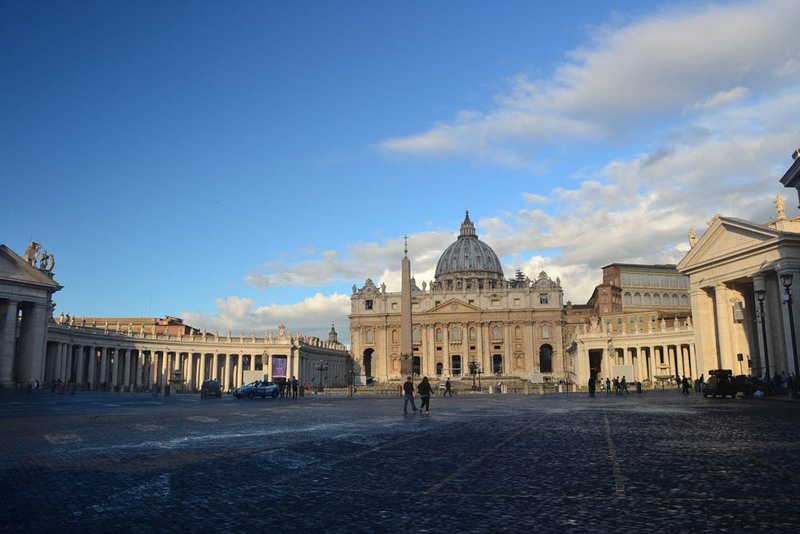 The next day is another grand day, with a tour of the magnificent St Peter’s Basilica in the Vatican. The astounding collection of art inside is enough to explore for more than a life time. Our guide, Roberta (Rroberrrta she calls herself) weaves us in 2.5 hours around the grand columns of the square. 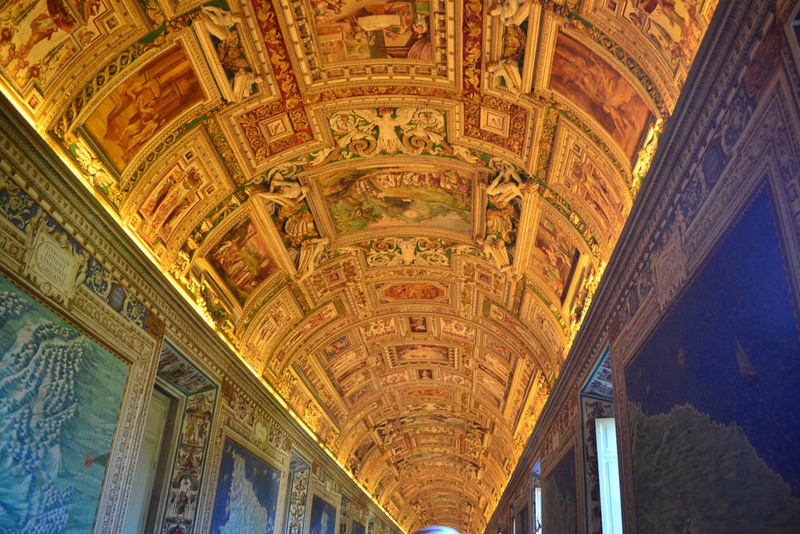 We take in the wonderful tapestries and gleaming, golden ceiling in the Vatican museums, the gloriously frescoed Raffael’s rooms, the famous ceilings of Sistine Chapel and the exquisitely architect-ed St Peter’s Basilica. St Peter’s Basilica is a beautiful place to be in, in the early hours of the morning. With few people in sight, it is a sharp contrast to the bustling square it turns into after we are done with our guided tour. It is guaranteed that you’ll be gaping up in astonishment, most of the time inside the museums of the Vatican. We’re tired at the end of the tour but nothing that a gelato can’t fix. And then, we dig into another Pizza for lunch. On the last evening, we decide to take it slow and skip the remaining touristy sights. 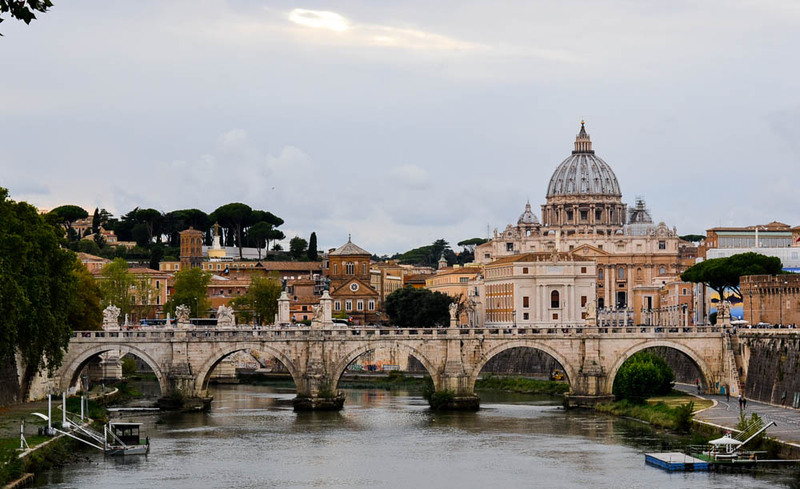 We grab a cup of coffee and sip it as we walk slowly to a view of the Vatican and the Tiber from one of the bridges, we look back on what has been a splendid 3 days in Rome. What a splendid collection of art and history line every street, every corner and every building in sight. In a contrast from the intimate crowds, the city feels huge and open. Lining the Tiber, across the Castel St Angelo, are a line of stalls offering second hand books, imitation paintings, lithographs, music records, tacky souvenirs and curios. We buy a couple of lithographs that at 6 euros, will offer us memories of the beautiful days we spent in Rome. Memories that will hopefully, be eternal for us. Last evening and one last loving look at the photo I first saw of Rome that led us to plan the trip in the first place. Ciao Roma ! 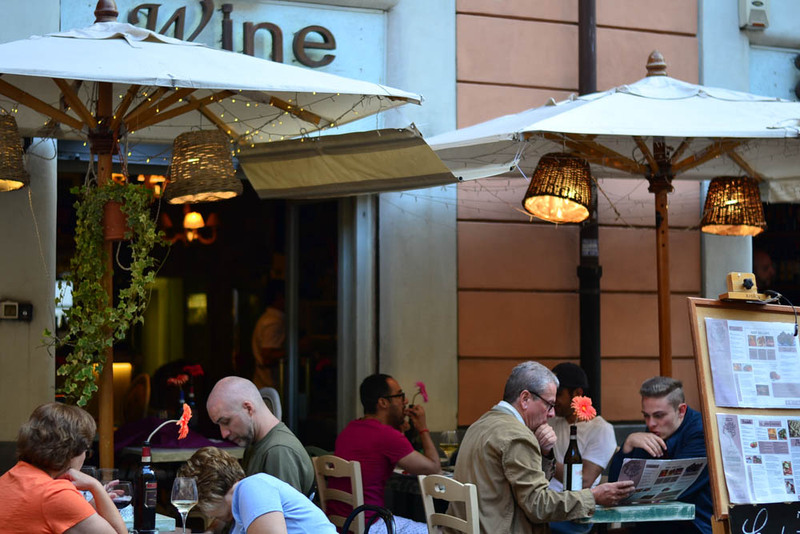 Stay: Although most tourists opt to stay near Rome Termini, and they offer quite a lot of stay options, we decided to opt for a lovely little place situated on Via Giulia, the Maison Giulia. They offer hotel rooms as well as a choice of apartments situated on the same street. Quiet and just a short walk away from the budget friendly neighborhood of Trastavere. 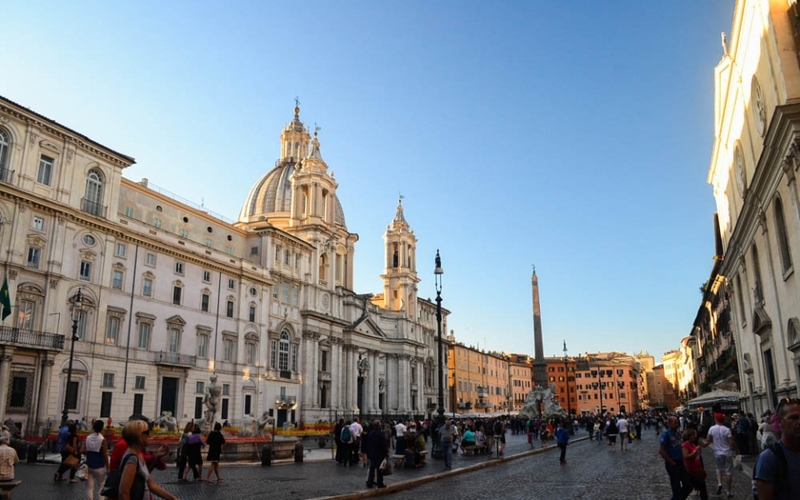 What is more, the hotel is also a 20 minute walk away from Piazza Navona and the Pantheon, as well as the Vatican. Rome can and should be explored on foot. If you can, also plan to take in the sights at night. The lit Colosseum looks brilliant when it glitters at night.